Percussionists Will Guthrie and Frank Rosaly share some elements of style, but perhaps as significantly, they are elemental forces of nature too large, restless and manifold to limit themselves to only a few musical styles and projects. 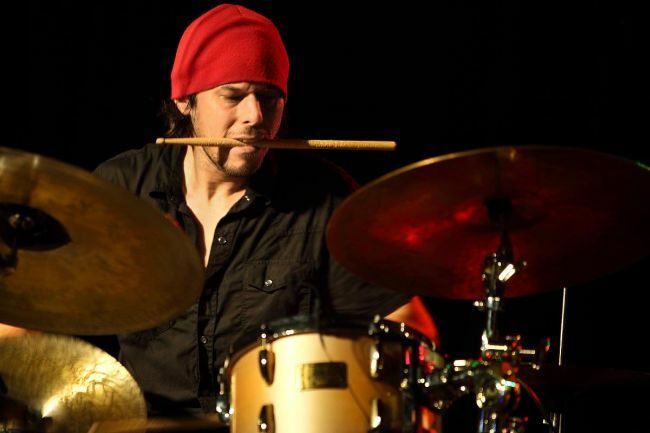 Guthrie once studied with Tony Williams, Rosaly with Billy Higgins, linking the pair to the root and source of some of the greatest jazz drumming of the past half-century. Both musicians are currently engaged in myriad collaborations that disregard genre, privileging immediacy and affect, what Bill Dixon called going to the center. Guthrie and Rosaly each released solo and collaborative works in 2012 illustrative of their omnivore's delight in sound-making; each lays to rest any question that at least a few contemporary musicians can move between sound worlds once regarded as antithetical, even antagonistically so, with stunning fluidity and brio. 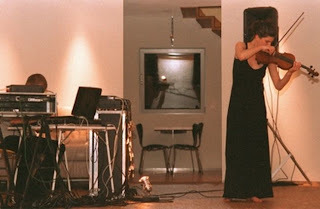 Will Guthrie told me in 2008, before I had any notion of whom the Austrian composer Helmut Schafer was, of seeing Schafer in concert around 2005 and being absolutely gutted by Schafer's performance. Every aspect of the experience - Schafer's physicality, the intensity of the sonic barrage, and the felt authenticity of the whole - left Guthrie in awe. 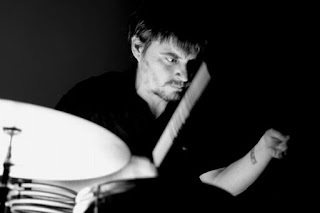 He subsequently arranged to collaborate with Schafer in a realization of the latter's piece Thought Provoking III, a trio with violinist Elizabeth Gmeiner Guthrie assembled, from rehearsal tapes at Shafer's home in 2005, and a church in Graz in 2006, the trio's threshing of Schafer's composition for salvaged church organ pipes, violin and Guthrie's subtle percussion. Thought Provoking III would not be out of place on a label like Edition RZ, more redolent of Takemitsu's electro-acoustic scores than anything heard by Schafer in his frequent, ear-scouring collaborations with Zbignew Karkowski, or Guthrie's equally raucous, riotous duo with Ferran Fages. Here poise and exquisite sound placement, a ballast of overtones, immense tension, and pervasive, barely audible creaks and groans, leave their mark - a little less bruising than a threnody, but the effect is subcutaneous, you'll be in its grip for awhile after its 24 minutes expire. Gmeiner's violin melds beautifully with Schafer's junk organ pipes, played by eliciting tolls and drones with hair dryers (!). For its duration, Guthrie contributes nuanced but assured sounds reminiscent of the palette heard on his solo release, Body and Limbs Still Look To Light, recorded around the same time. The spell is broken quickly at the entrance of the second piece, Averaging Down 20xx, a mix by Karkowski sourced from TPIII; your ability to transition from the environment created by the trio, to Karkowski's gasps, sputters and bursts of hiss may be different from my own. Upon each listening, I pause between the pieces, giving the trio, and myself, breathing room before allowing Karkowski to enter with his own assemblage of Schafer's original material. Schafer committed suicide the year following their collaboration; he was 38. Guthrie, at 35, has released a painstaking, presumably painful (as well as exultant) reassemblage of their encounter. I cannot imagine a stronger offering of that meeting. Thought Provoking III occupies that position we all know, held by various works we are lucky enough to live with - works of immense beauty that you realize, even in this super-small firmament, few will hear. Guthrie's solo release, Sticks, Stones & Breaking Bones - upon hearing it you grasp how apposite its title - is a percussion version of the marathon monks of Mount Hiei's practice of kaihōgyō - the monks undertake a combined practice of meditation, calligraphy, and marathon running. The running involves 1,000 days; the monks are allowed to withdraw in the first 100 days, the novitiate period. After completing that phase, withdrawl is not an option - you complete the run, or commit sepuku. With this piece I want to see what happens when the body is pushed to it’s physical limits, Guthrie says; it is ultimately the very human physical limits that guide and direct this piece, how long it goes for, when change happens, and in which capacity. While failure to sustain the work would presumably have been less dire than the same outcome for the monks (although knowing Guthrie a bit, who knows? ), we'll never know, as Guthrie seems to transcend fatigue, faltering and any discernible human limits, and becomes, as Roswell Rudd said about Milford Graves, an anti-gravity vortex in which you could either float or fly. While endurance has to be mentioned, no less here than when considering the skills of elite athletes, S, S & BB is much more than a tour de force of physical rigor and stamina. Guthrie generates endless drum patterns, tattooing and interlocking beats, changing tempi and markings with alacrity, building, in the final piece, Breaking Bones, to an astonishing crescendo of quarter notes drilled at a BPM that would cause metronome failure. Whether Guthrie had a taste of the satori only a few of the monks of Mount Hiei have enjoyed, the experience for the listener is a joyous one. 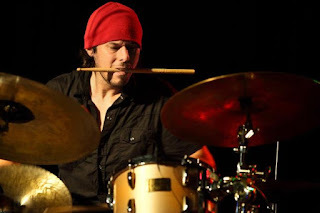 Francisco Javier Rosaly Amoros Rosello has got to be in contention for the honorific, the hardest working musician loose in Chicago today - and, yes, I am well aware that crown has sat upon Mr. Vandermark's sweaty brow for some time. Since 2001, Rosaly has been a force in improvisation, community-based education, curating, composing, and generally organizing, and fitting himself to, the creative music scene(s) in Chicago. I met Rosaly in May of this year, and though it is a small sample-size, consider this - tipped by another Chicago musician to his performing that evening in a trio of bassoon, voice and percussion, I went to hear him play. Upon completing their set, Rosaly jumped up, gathered his kit, and hied down the street a mile or so to play a solo set at another venue. We, the modest throng attending the trio gig, followed Rosaly down the road, and heard a stunning set of illimitable ideas-in-motion. I have since learned that that is pretty much the workaday world that Rosaly invests with immense energy and, more strikingly, an acutely active conscience. Rosaly gives back to his adopted city weekly in workshops with students and unstinting advocacy for his fellow musicians. This September Rosaly released a solo document, Centering and Displacement. A score was created from improvised source material, shaped and segmented by chance operations (here Rosaly used playing cards, not the I Ching's yarrow stalks); the process from there, replete with software, reassemblage and the like, can be found on Rosaly's web site. Of note to this listener is that gradually Rosaly's working method returned the amassed sounds to a simplification of sorts, the sourced percussion and electronics boiled and distilled down to the 29 minutes heard on the vinyl release. This distillation proves to be wise, as the piece, throughout its four discrete sections, representing movements of a sort, is superfluity-free. Recall Dixon's kindling cry to improvising musicians - strip away the filigree, go to the center! Rosaly's admixture - burbling, unstable low frequencies, sliding pitches, stabbed speaker-cone fuzz-outs, and percussion episodes eliding from bursts of free playing to gamelan-y chimes to Konono Nº1-style likembe, to the final section, metal scrapings and scourings that sound like Rosaly is playing an amplified Richard Serra sculpture - never sounds overcooked. There is a sense of ritual to this sound poem (Rosaly's descriptor) reminiscent of Jon Mueller's latest work. Rosaly can also be heard amid the three reed-player/three percussionists ensemble, The Boris Hauf Sextet, whose Next Delusion gives the drummers some, often in striking ways. A collision of musicians that on paper might suggest fractious, frantic results, is instead a gestalt of tempered, balanced, largely restrained playing, with egos in abeyance and empathy keenly evident. You can refer to Bill Meyers' fine liner notes for a run-down of Hauf's affair with the city, but I do find one aspect of this ensemble's joined sensibilities of interest. 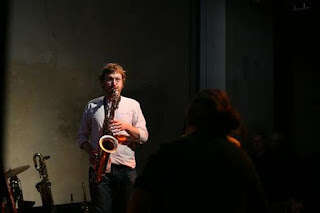 Essentially the Sextet is an encounter between Chicago improvisers of the Umbrella Music Collective (Jason Stein, Keefe Jackson and Rosaly) and musicians associated with (let's forgo bickering about placeholder names) EAI (Michael Hartman of T.V Pow, Hauf with his Efzeg affiliation, Steven Hess of, among many projects, Haptic). A little research reveals that all of the Sextet came to Chicago, from every direction, between 1999-2001. Efzeg became active in Vienna in 1999, but Hauf began his infatuation with the Midwestern city that year, returning annually, more or less, to this date; Keefe and Rosaly hit the city in 2001; T.V. Pow, as a trio, became active in the city at that time; in other words, the present-day Sextet gathered in Chicago at least 12 years ago, drawn to it as a burgeoning locus for experimental music. That's one aspect of this collision. The music at hand owns some of the blurring of individual roles associated with Efzeg or Haptic; the horns often braid and twine together without solos or a foregrounded voice. There are passages where, oddly and refreshingly, the three drummers lay out, opening a World Saxophone Quartet-like space for Stein, Hauf and Jackson's stacked harmonies. The flip is true as well - one piece finds the percussion rumbling alone, with an admirably tamped-down fire. There are occasional bursts of frenetic reed work, though reigned in and always returning and folding back into the whole. Somehow - and I count this as no small feat - Hauf has immersed himself for many years in his adopted city, his love for the improvisation forged there self-evident, without becoming derivative or diluting his own sound and approach. This enables the Sextet to be a strange brew, an authentic collective, remaining horizontal, unimpeded by egos, and able to foment, as they do on Next Delusion, a surprise or two. this obsessive house of mirror music is Guthrie's descriptor for his solo project. Thanks to musician Nathan McLaughlin for reminding me of Bill Dixon's pith phrase. Excellent - reading this makes me want to break out the traps and start drumming again !